‘Resume’, when that word enters in our conscience the first image that pop ups in our mind will be a professional resume, well written and each of your achievement mentioned carefully. But stop your imagination for a moment and think “Is this the only task a resume can do?” Do we need resume only for professional reasons? May be in most cases majority of people say yes but this is not the only task resumes do. Failure resumes also are a very important part of successful life. A failure resume is not your typical resume to highlight your quality and achievements which you use to get good job and company. But the failure resume is a resume where you list all your failures you face in your life whether academic, personal or professional failure and use them to improve yourself. Failure resume helps you in finding what goes wrong due to which you failed even after your best attempt. It also make you realize that you succeed in life even after facing failure in your life and what you learn from your failures makes you a better person. There is a big difference between failure and mistakes so do not think your mistakes as your failures. 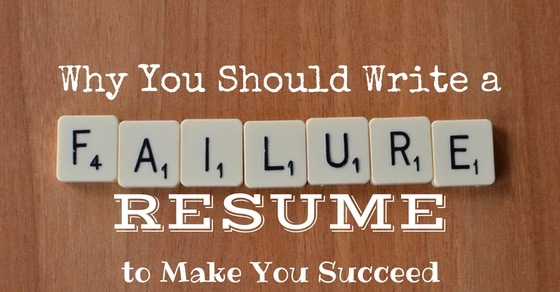 Why You Need a Failure Resume? Many people think motivation comes from great and legendry people who had done something extra ordinary in their life but every success story have some hidden failure resume which are hidden in the light of success and you just see the outer success not the inside hard work and dedication. Your own failure resume works as a great motivation for you because when you write your failure resume, you know your weakness and plus points more clearly and can make clear decisions for current situation. Your failure resume is your best teacher because lesson learnt from failure are far greater than what you learn from books and helps you throughout your life. A failure teaches you how to fight back and never let go the ray of hope and you will see sunrise soon. Failure resume is just like some personal test where you are your own teacher and the way you are going to assess yourself will decide what our life will do after failure resume. Your failures helps you in finding yourself. We all are so busy and our success is more important to us than anything else but failure helps you in realizing nothing is permanent not even success and failure and live your life in best possible way. You can connect to yourself very easily when the time of failure stuck. Failures are necessary to make your living a great experience. Don’t play too safe because failing here makes you more of a human than robot and when you don’t fail that means you are not trying the way you should or being extra conscious. Failures in your life helps you in self assessment. You can analyze yourself in deeper way when you create your failure resume because it helps you in knowing what the reason of failure was and what you can do now to make it more successful also it shows that you are trying. How to Create Failure Resume? Creating a failure resume is easier than writing resumes for profession like jobs because when you create a failure resume, it is for personal uses rather than professional purpose. You don’t go and share your failure resume with your employer or boss but failure resume is to enhance yourself at deeper level. Now most important is how to create failures resume? It is easier said than done. Putting your all fear on a sheet seems easier task but in reality it takes lot of courage to admit that you fail multiple times in your life. To create an honest failure resume you have to put all your failures on the sheet and keep some space free below each failure to write other things. When you prepared your failure sheet, ask yourself why this happens and ask again and again till you get your answers from yourself because deep down we all know the real reason of failure but don’t want to admit. So write the answer of all why’s below the failure and also why this happens. Be honest when you create your failure resume. Writing about failure is easier than writing about the cause and lesson you learnt from your failure. When you ask why this happens, you get your answer i.e. the cause of this failure but what you learn from this failure is also important. The reason to create failure resume the most important one is the lessons you learn from your failure, so without cause and lessons failure resume is incomplete. After you are done writing your failure resume, analyze your failure resume. The purpose to create a failure resume to know what was the reason of the failure, what you learn from your failure and self assessment and to fulfill that requirement you need to analyze your failure resume because no one else is going to do this for you, you have to it yourself because you are your own boss in your life. Now create another fresh sheet to mark new beginning with the lesson learnt from your failure resume. The reason to create new sheet is to maintain your lessons because your failure teaches you some amazing things and to keep them with you need to prepare another sheet. After you are done with your failure sheet, write a sheet about what you learn from your failures because your failures are your best teacher and the lessons you learn from your failures stay with you forever but you can’t keep everything in your mind forever so write what you learn from your failure resume and keep them with you so that you can remind yourself wherever you need. The main purpose of creating failure resume was to learn from your failures and self assessment and when you do all of these things you need to implement all this information in your life but implementing everything takes time and some modification because every small change brings big differences in your life. Now the question is how to implement lessons from your failure resume into your life? A big change comes from so many small changes and once the thing that look impossible can easily achieved, so start with the small changes in your life. The things that you learn from your failure resume divides them into small part of information and then apply that small part in your life and follow this procedure till the whole task is done. That way you can easily implement new things. Keep the track of all the changes you are making. Make yourself more flexible to absorb new information and keep everything on sheet as well in your mind. Keeping track also make implementation little easier because when you change yourself for the good, you need lot of motivation to succeed because distraction are sitting outside to divert your mind. Your lazy attitude is your worst enemy because you can’t see the consequences in the haze of your laziness but it cause damages for big time. Your lazy attitude is your worst enemies because you never realize that your own habits are the reason of failure. Lazy attitude never make you succeed in your life because you lost so many opportunity just because you being lazy. Post small cards of motivational quotes from what you have learn from your failure so that you can’t forget lessons that easily. Write and post method come in handy when you need something to keep in mind and going to use later on. You can write and post that way, you don’t have to waste your energy to think and memorize them so create small post and keeping them close is easier than other methods. Your personal diary is your personal secret holder. Personal diary is a friend without question and demand and keeps all your secrets safe. Keeping them in our personal diary can also help in keeping lesson close and learn and will be staying at safe place if you need privacy for your lessons. Personal diary also help in creating failure resume. How to Move on from Failure? We all need some type of closure in our life for all the events that happen in our life to move on and leave the past behind. Moving on from your failures is also important because sticking at one point of time will not take you anywhere. Moving on also needed to use all the information you get from your failure resume. Failure resume helps you in knowing your true potential and inspiration and moving on helps you in using and implementing them in your life. Don’t be too rigid with yourself when it comes to using them because no matter what, a little breathing space is necessary and you have to use new tactics and methods too as well as some open approach to move on. Do not hang on one failure throughout your life. Everything happens for a good reason and you have everything most people desire so do not stop your life on one issue and failures are going to come in this journey of life. You are going to face every challenge and learn from it. Do not keep yourself in the delusion that mistakes and failure is the same thing. Mistakes are incorrect action by you and failures are lack of success due to some reason, do not mismatch them and keep yourself repeating same mistakes or to travel same road of failure. To move on, you need to make yourself not to repeat mistake and learn from your failure so that you can avoid same situation again. Failures in our life are our greatest teacher, most people think failure as set back and stop living or take some disastrous step because according to them failure is end of life but the reality and the truth is that failure helps to make you better and strong individual. So many great people face failures in their life but they take that failure as opportunity to do great things and their honest effort makes them succeed. Failure resume works just like some great achiever to motivate you, everyone in their life should write their failure resume and bring positive changes in their lives and you will be amazed to see so many beautiful changes and things. Failure resume is like a report card you need to prepare for your own self because it helps you in pointing out what you need to do to make yourself successful and know your faults so that you can change them and make the better person out of yourself.